The text below is an adapted excerpt from MELTDOWN: Climate Change on the Tibetan Plateau, featured on UTNE Reader this week. There are some places in the world where you don’t want to get a flat tire. 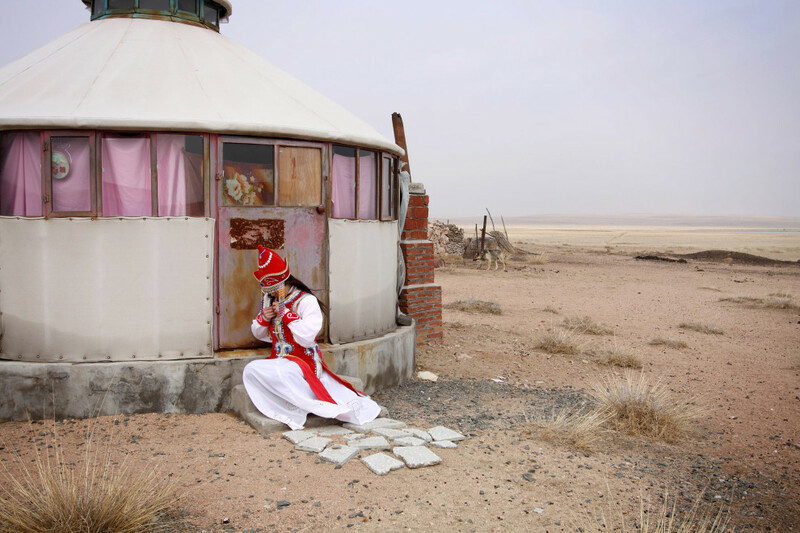 The middle of China’s vast Taklamakan Desert—with no cell phone coverage and no hint of civilization—is one of them. So when we got our second flat tire on our trek, we started to worry a little. We were suddenly a wheel short and a long way from help. Sitting in our now three-wheel four-wheel drive, our chances of reaching our destination were starting to look slim. I started to wish that I had a camel instead of a finicky car. Our driver managed to hitch a lift back into town while my guide and I sat in the silent desert. It wasn’t all bad though. After all, the desert was part of what I had come to see. 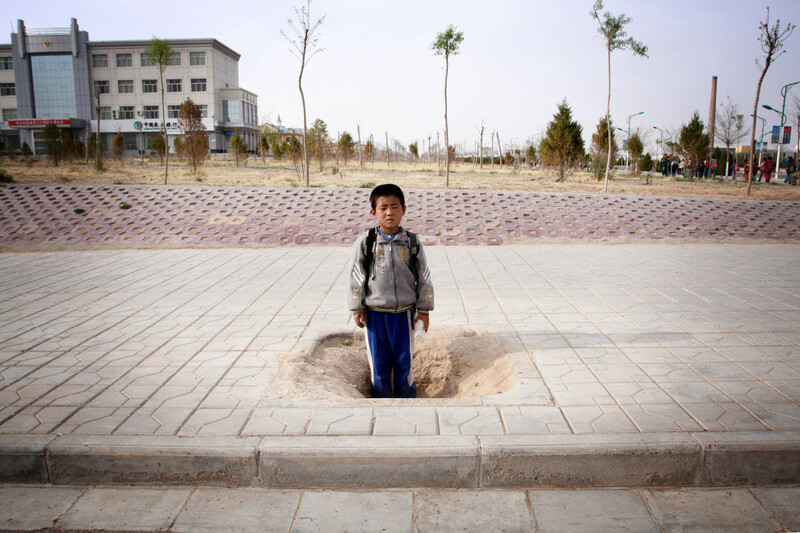 China is home to massive deserts, many of which are growing. Desertification, the process of turning arable land into desert, is arguably the most important environmental challenge for China today, affecting food security, transportation and even international relations, as sandstorms originating in China blow through neighboring countries and even across the Pacific to the U.S. 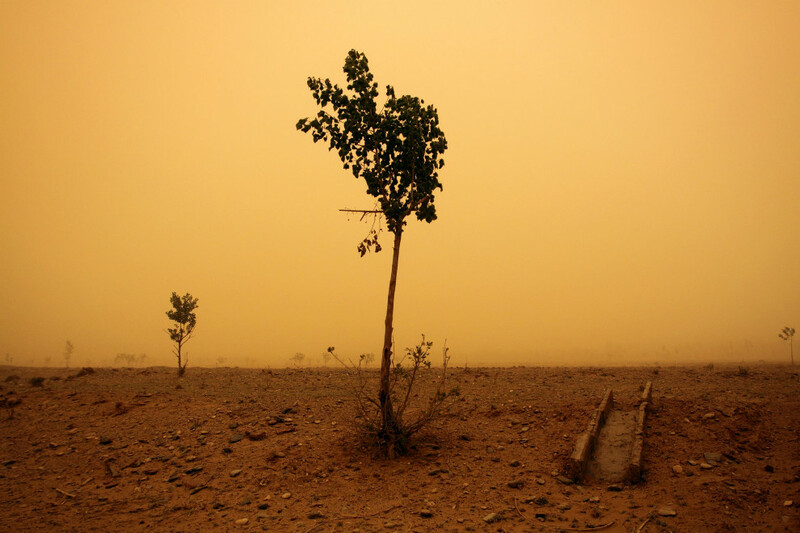 While it has only relatively recently been the cause of alarm, it is a problem with ancient roots: an estimated 40 cities in China have been abandoned due to desertification over the last 2,000 years. Looking back into these ancient cities and routes can help us learn from failed attempts at handling the sands. Our destination was Yinpan, a ruined city that had been a thriving and diverse city of merchants and traders 2,000 years ago. A stop on the fabled Silk Road, it welcomed travelers from across Asia. Today, Yinpan is approximately 300 kilometers east of the modern city of Korla. Or if you put it another way, Yinpan is 300 kilometers from anywhere. 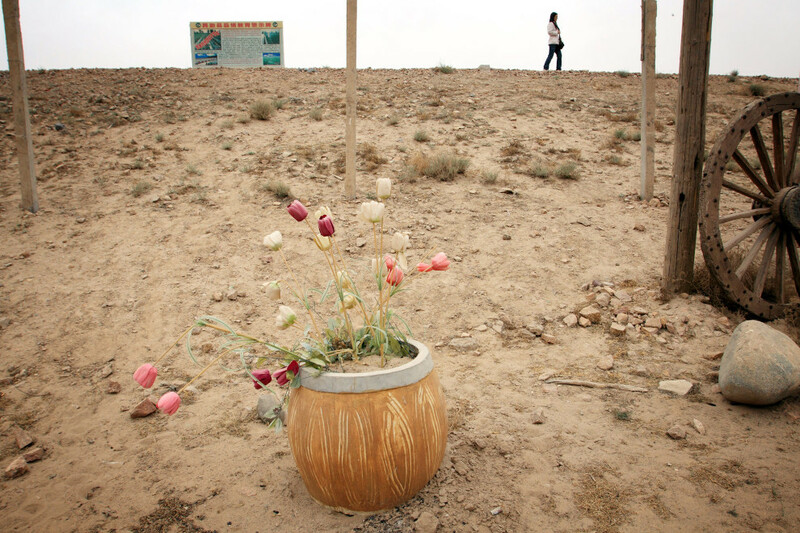 It sits on the edge of China’s most formidable desert, the Germany-sized Taklamakan. 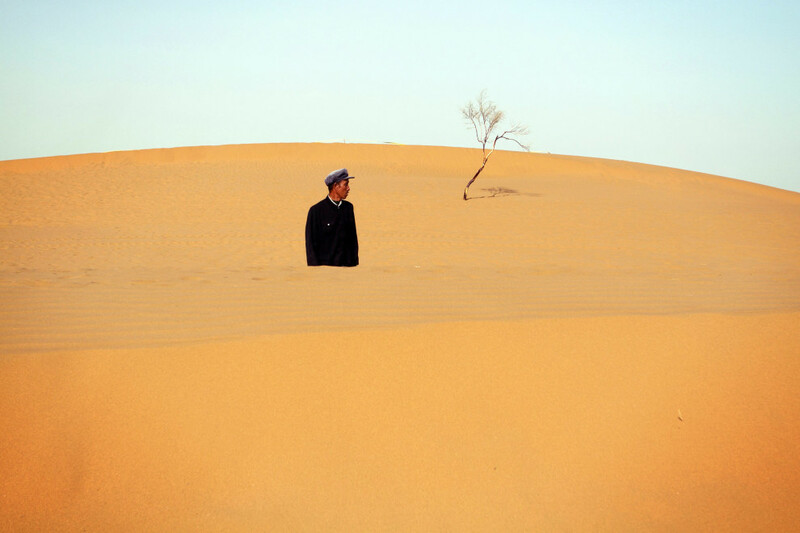 A man walks amongst the dunes of the Tennger desert, near the Shapotou desert resort in Ningxia Province. 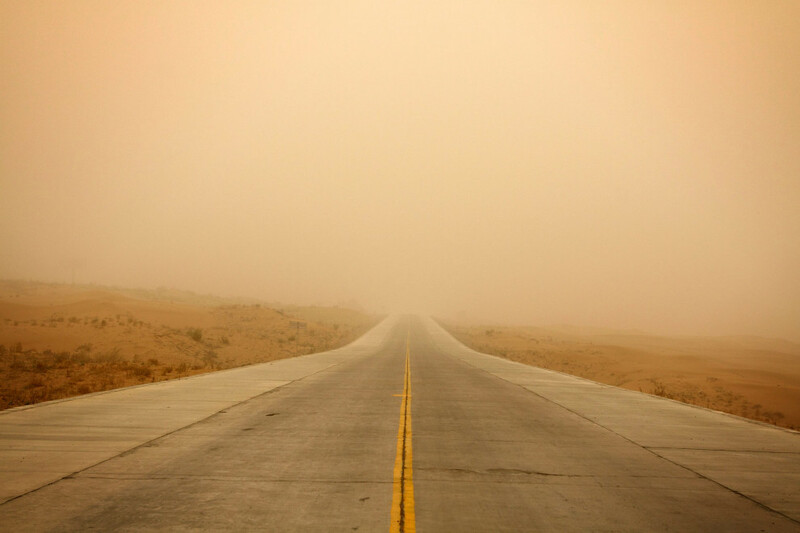 A severe sandstorm in central Ningxia province shrouds the land in a surreal yellow, almost orange, light. The already dry and degraded topsoil is easily picked up when the spring winds start to blow. 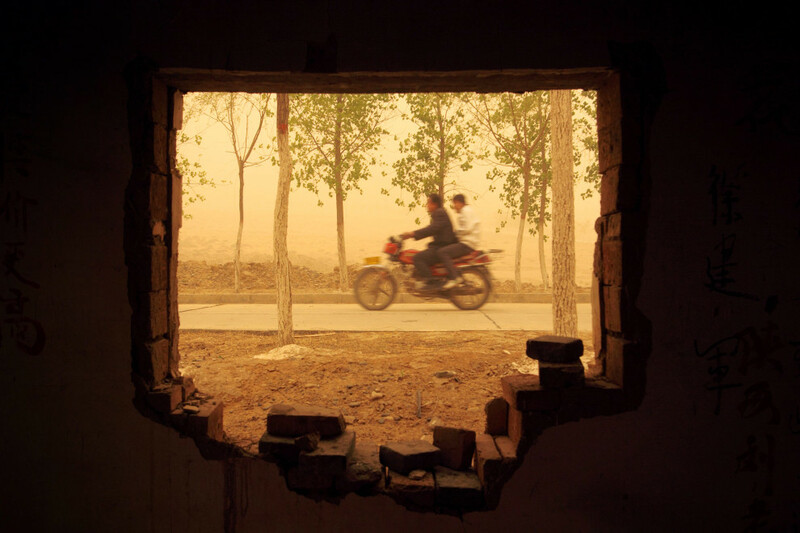 A sandstorm disrupts local life in Ningxia Province. 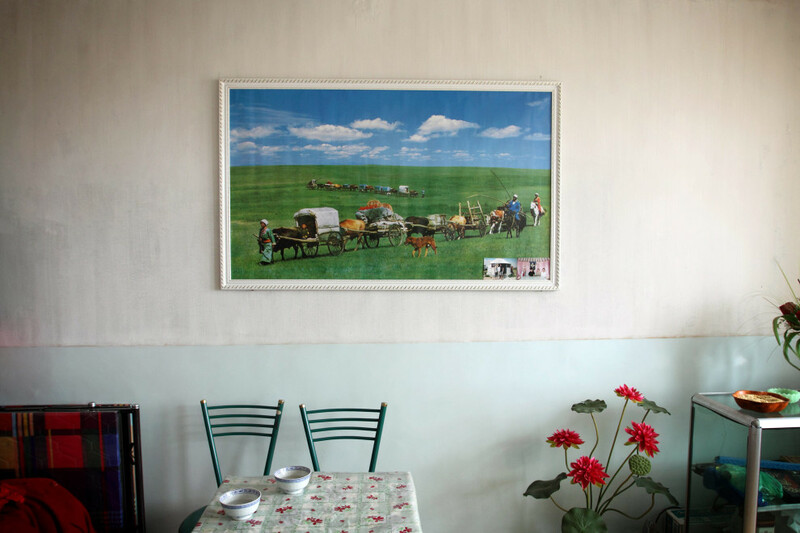 A painting of traditional Inner Mongolian life hangs in the living room of farmers on the Inner Mongolian steppes. This traditional life disappeared in the 1980s. Faint glimpses of traditional life on the grasslands remain as a tourist in traditional dress adjusts her clothing. A woman protects herself from the airborne sand which has descended on the town of Minfeng in Xinjiang province. 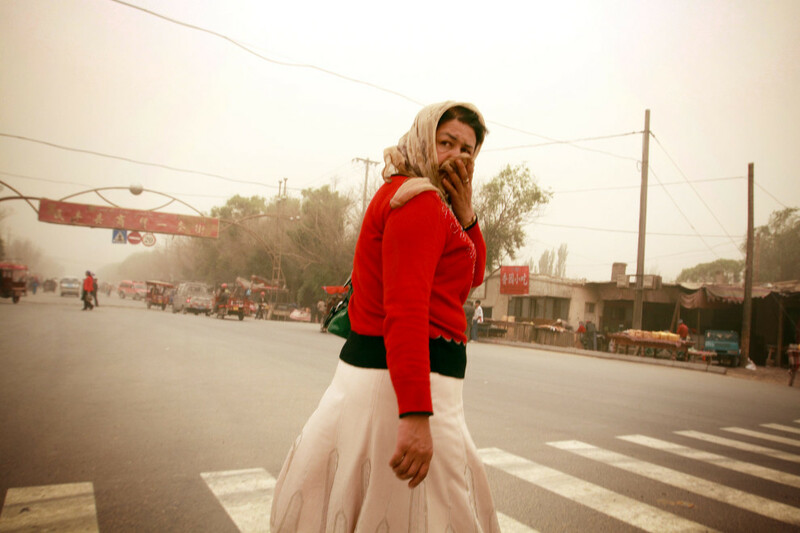 The town’s proximity to the Taklamakan desrt means it is regularly bombarded by sandstorms. 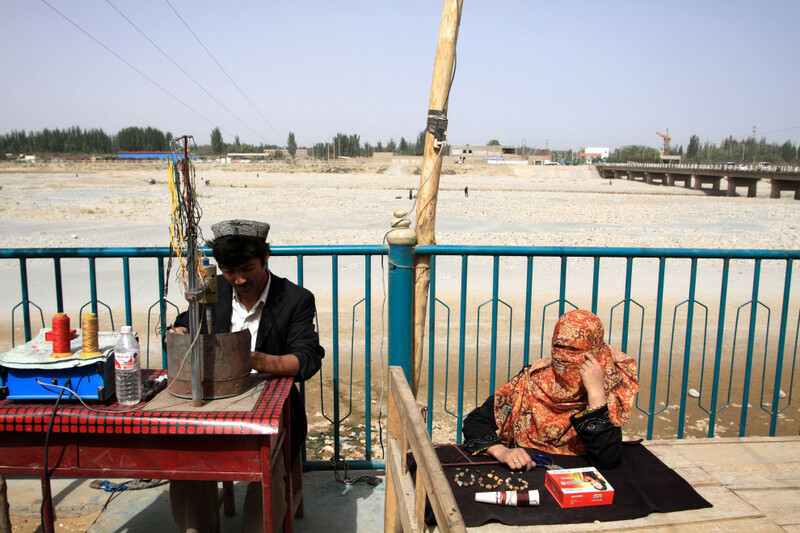 A small market next to a dried-up river in Xinjiang Province, western China. 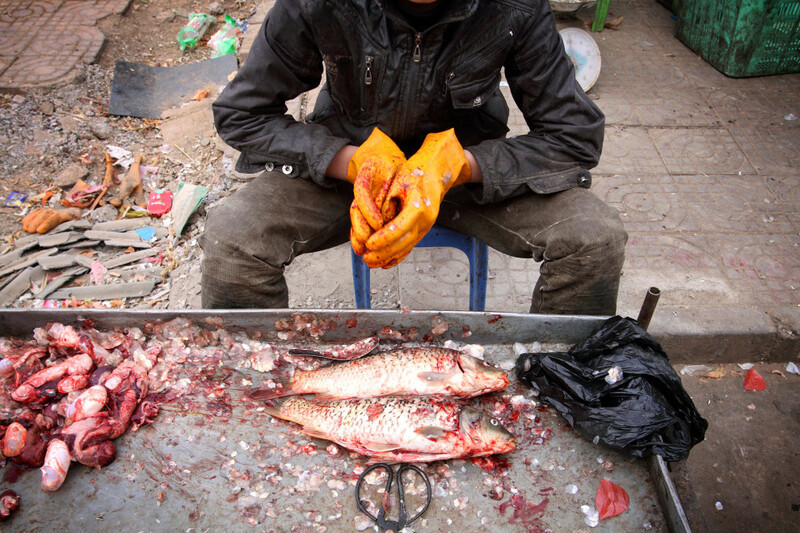 Fish on sale in a small market in the town of Hongsibao in Ningxia Province, central China. The banks of a reservoir in Minqin County, Gansu Province. A worker sleeps amongst the sand dunes and forest at the Shapotou desert resort in Ningxia Province. 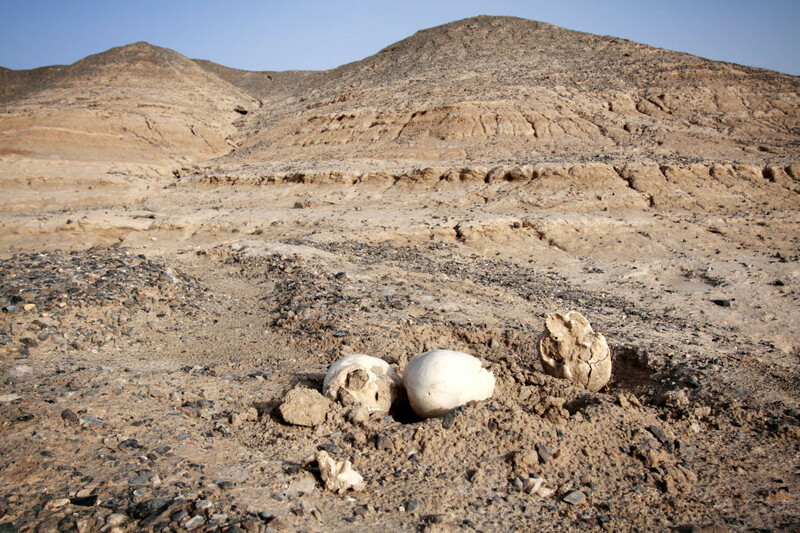 Human remains scatter the floor in the abandoned city of Yinpan, a result of a combination of natural erosion revealing graves and disturbance by tomb-robbers. 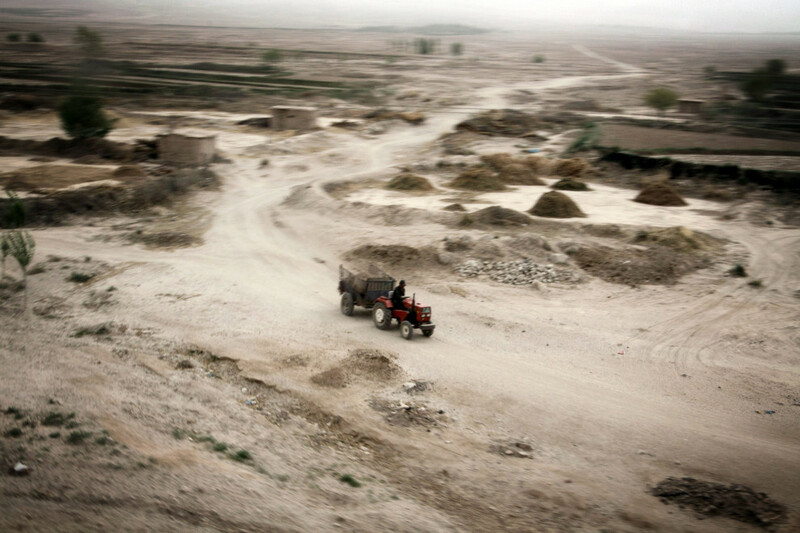 A tractor drives through dry and barren lands in Gansu Province, China. 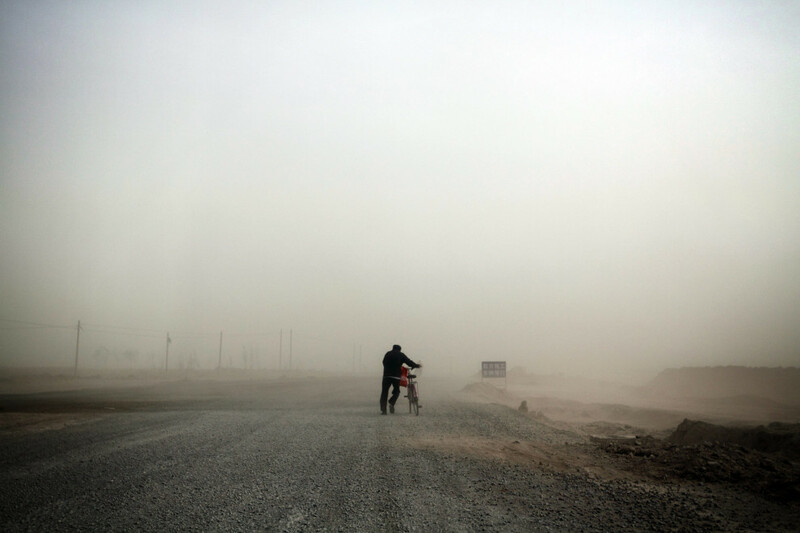 A man pushes his bicycle through a severe sandstorm on the outskirts of the town of Hongsibao, in Ningxia Province. 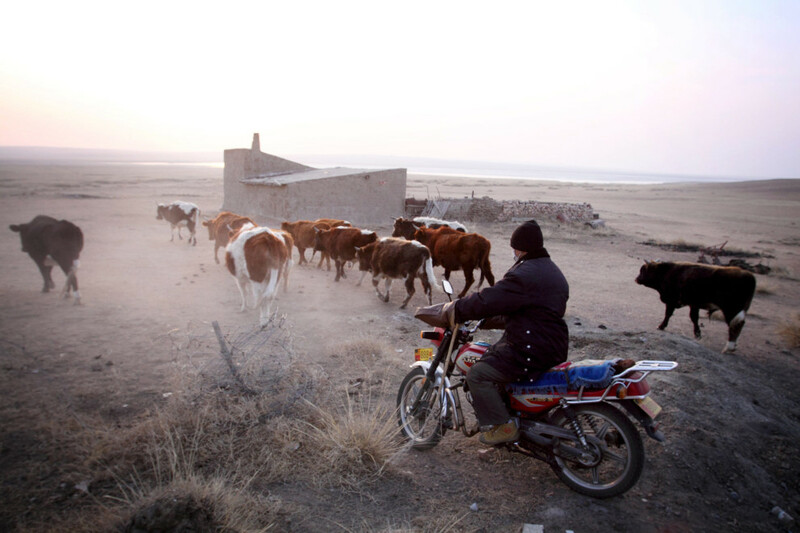 A farmer brings in his cattle at sunrise on the Inner Mongolian steppes. Due to new regulations, the farmers of the region are now not allowed to graze their cattle, although many risk prosecution and graze their cattle at night, under the cover of darkness. 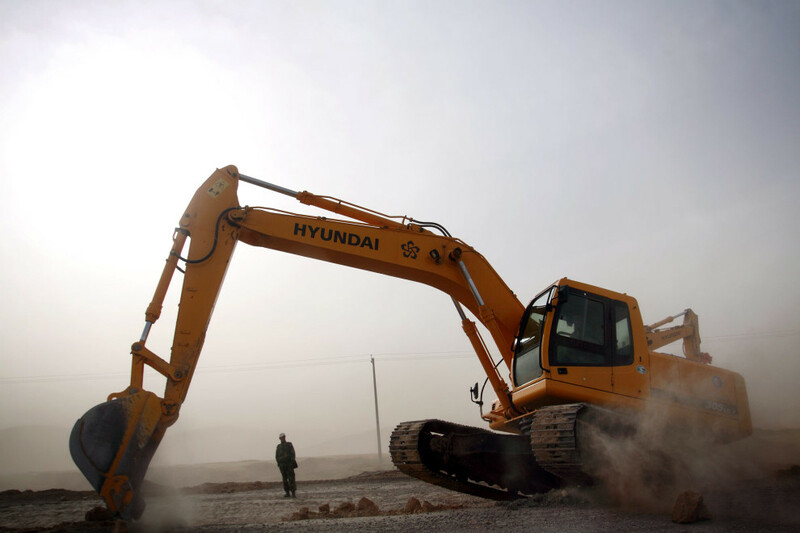 A construction crew working in a sandstorm in Ningxia Province. 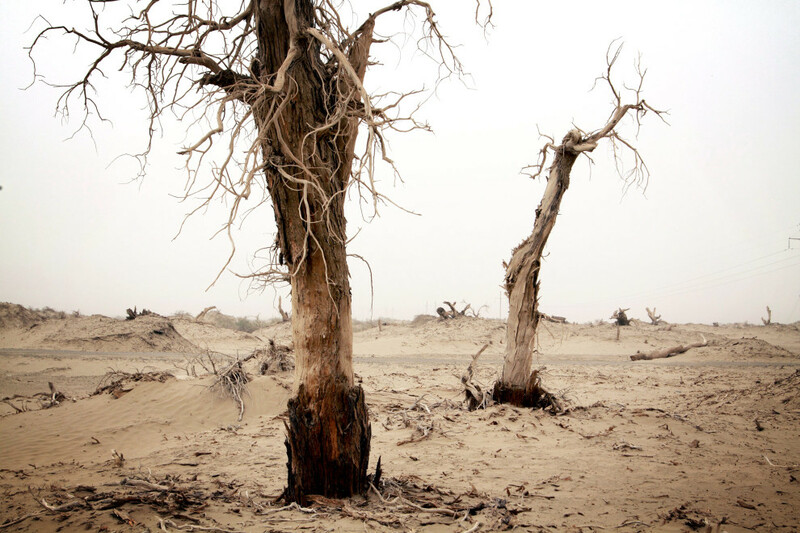 Dead poplar trees stand on the edge of the Taklamakan desert in China's western Xinjiang Province. 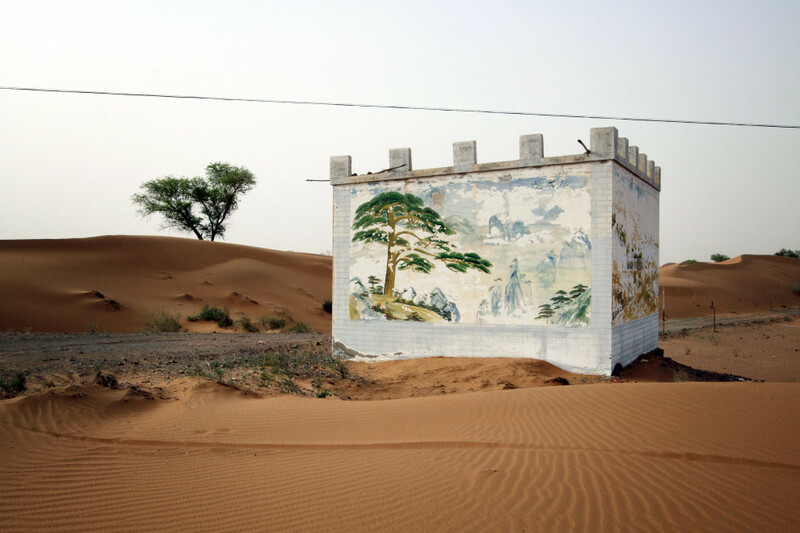 A mural on a wall in the deserts of western Inner Mongolia. 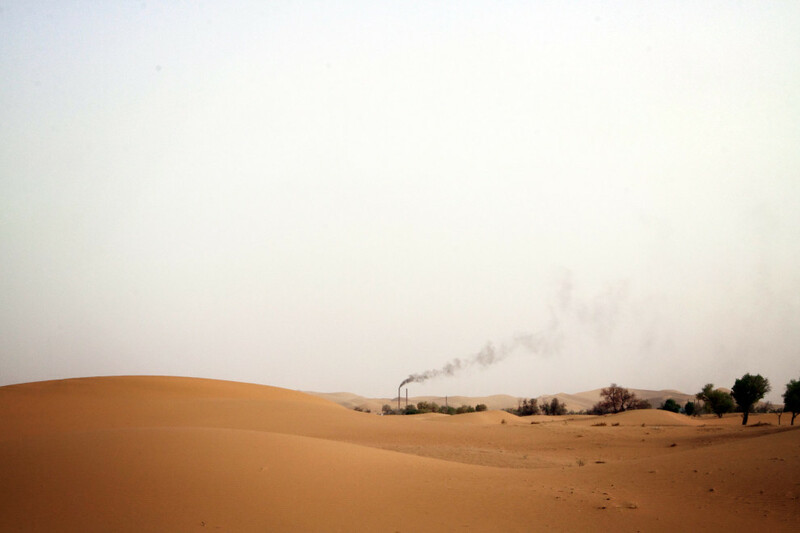 Smoke bellows from a lone factory in the deserts of western Inner Mongolia. Visibility during a sandstorm in Ningxia Province is reduced to all but a couple of hundred meters. Two thousand years ago, Yinpan was situated in an oasis, with rivers flowing nearby. But 1,500 years ago, the once-prosperous city was mysteriously abandoned. Today, all that is left is mounds of sand almost undistinguishable from the surrounding desert. Chinese archeologists hypothesize that two things happened. One was that the route of the Silk Road changed, reducing trade in the area. The other is that the oasis turned to desert as the river courses shifted and local water supplies were exhausted. After thousands of years, nature is still assaulting the city. Spring sandstorms and summer flash floods batter what little structures remain, sometimes exposing the bones and belongings of former citizens. While it’s been left alone for much of history, the Taklamakan region is suddenly in the limelight: oil has been found under the desert. And so new towns of oil rigs and oil workers are popping up along with a new global trade route to usher the precious black gold to market. Meanwhile, on the outskirts of the desert, the ancient Silk Road and one of its large trade towns, Yinpan, wastes away. The ominous question lingers in the desert air: What other cities and trade routes of today will end up like old Yinpan, wiped off the earth by sandstorms and floods?